Last years 72nd Members Meeting saw the Gerry Marshall Trophy the most popular race with the spectators taking a shine to the 1275 GT Mini as both Nick Swift and Jason Stanley forced their way in front of the Chevrolet Camaros, Triumph Dolomites, Rover SD1s and Ford Capris, showing fantastic driving skills and and plenty of guts! This year, taking on the driving duties in the Sunday race will be 2013 BTTC champion Andrew Jordan, who is no stranger to Goodwood. 2013’s Goodwood Revival saw Andrew Jordan and his Dad Mike Jordan in their very own A40, in which they finished in 2nd place. Nick also has his fingers crossed for another successful weekend after claiming 3rd place in the owners only race at the 72nd Meeting last year and 4th place in the second race. 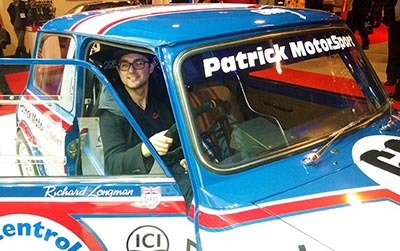 Swiftune will also be featuring in the race with the original Jon Mowatt 1275 GT Mini which is currently being restored by Swiftune in exact livery from the 80’s.